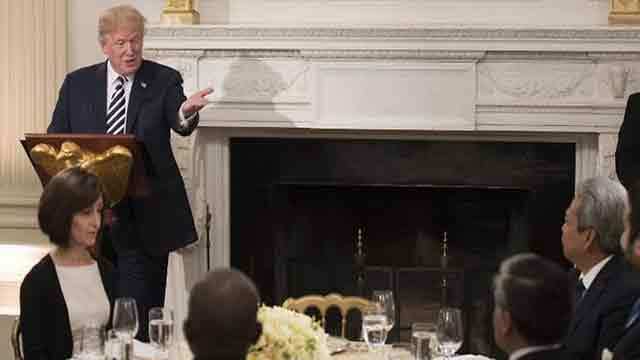 White House Correspondent, Jun 6 (Just News): Wishing Muslims across the world a “Ramadan Mubarak”, the United States President Donald Trump on Wednesday hosted his first White House iftar dinner for holy Ramadan. “Iftars mark the coming together of families and friends to celebrate a timeless message of peace, clarity and love. There is great love,” Trump said at the event. There were more than 50 guests. At the head table, Trump sat with Saudi Ambassador Prince Khalid Ben Salman, and Jordanian Ambassador Dina Kawar. Ambassadors were invited from the United Arab Emirates, Jordan, Egypt, Tunisia, Iraq, Saudi Arabia, Qatar, Bahrain, Morocco, Algeria and Libya. “To each of you and to the Muslims around the world: Ramadan Mubarak,” Trump said. “In gathering together this evening, we honor a sacred tradition of one of the world's great religions. For the Islamic faithful, the iftar dinner marks the end of the daily period of fasting and spiritual reflection that occurs throughout the holy month of Ramadan,” the president added. “Only by working together can we achieve a future of security and prosperity for all. For this reason, I was proud to make my first foreign trip as President to the heart of the Muslim world, where I addressed an assembly of more than 50 leaders of Muslim-majority countries. That was something,” the president said.